The Amazon experiences microclimates. This means that rain can occur in a particular localised area while other areas remain sunny. 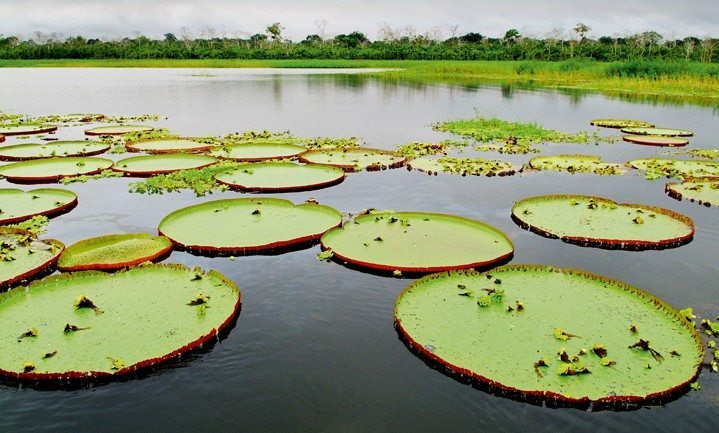 You will see spectacular Amazon wildlife, birds and plant life at any time of year. For instance, you can definitely see the Amazon’s rare pink river dolphins. There are two key seasons in the Peruvian Amazon: a low water season that lasts from June to November and a high water season from December through to May. Cruising in either season presents explorers with a unique experience of the Amazon as water levels differ as much as 23 feet (7 meters)! In the low water season, many of the trails and jungle paths that are otherwise submerged in the high water season are easily accessible, allowing explorers more opportunities to experience the Amazon rainforest on foot, which for many is still the preferred way to experience a rainforest. The low water season also typically sees less mosquitoes. On the other hand, significantly lower water levels also mean that some creeks and lakes (otherwise accessible by skiff during the flooded season) are out of reach by our launch boats. Our itineraries take advantage of the conditions in each season. During the low water months, fishing is ideal as aquatic populations are confined to a few key areas. For example, it’s far easier to land a piranha! For birdwatchers, dozens of species of migratory birds are in flight in the Peruvian Amazon during the low water months. When cruising the Amazon during low water, guests will also see the amazing imprints of the high water season. Water marks are apparent on trees and the exposed mud banks, especially at ribereños villages. Locals carve mud stairs into these very steep river banks in order to get from the river to their village! Regardless of low or high water seasons, exposed mud banks also tend to attract large numbers of colorful macaws, who feed on clay to neutralize these toxins from the food they ingest in the forest. For visitors to the Peruvian Amazon at this time of the year, the key highlight is the dramatic high water panorama of the flooded forest. The Amazon Basin’s rivers and streams rise about 23 feet (7 meters) higher than during the low water season. Aside from the stunning visual effect, this also means that every river, creek and lake is navigable. Aqua Expeditions launch boats take advantage of this and cruise further on the wildlife-rich waterways of Amazonia, bringing our guests closer to the jungle tree canopy while having less trekking on foot to do. Exploring a rainforest mainly on water is also a unique experience. During the high water season, the reduced area of dry land could also mean more concentrated sightings of certain wildlife and birdlife. Certain aquatic creatures such as turtles and caimans, species that need to get some sun every day, are often easily spotted during the high water months. In the meantime, with skiffs sailing nearer to the tree canopies, the Peruvian Amazon’s kaleidoscope of endemic monkeys and bird species are nearer to the naked eye. That said, most species can be spotted throughout the year, the only difference is in the manner they’re seen, from the ground of the lush forest or aboard a skiff. Both are uniquely enchanting in their own right. On the flip side, the high water season sees mosquitoes becoming more prevalent, especially on jungle trails. Fishing requires more patience during these months too, locals only manage to catch about half the fish they would otherwise get in the low season. A perfectly balanced rainforest ecosystem has both sunshine and rainfall, and the Amazon is no exception. The Peruvian Amazon receives a healthy 12 feet (3.6 meters) a year on average and experiences 250 rainy days. The good news: It rarely rains for more than an hour or two. Rain most often falls in passing cloudbursts, in line with the microclimate weather behavior of the Amazon ecosystem. Aqua Expeditions taps on the collective experience of our crew and guides in the Amazon to create an itinerary that ‘works with the weather’, for instance conducting excursions at times when rain is less probable. Our local naturalist guides are also adept at sensing the weather before it changes. Guests receive sturdy ponchos in the event of inclement weather, so they can stay extremely comfortable and focus on the astonishing Amazon jungle scenery and wildlife. This is the warmer of the two seasons, with temperature averaging about 98 degrees Fahrenheit (36-37 degrees Celsius). The low water season receives 20-25% less rainfall than the high water season. At this time the average temperature is 86 degrees Fahrenheit (30 deg Celsius), 12 deg F (6-7 deg C) cooler than in the dry season. Although the water levels swell significantly, the increase in rainfall is relatively less drastic: 20-25% higher than that of the low water season. For example, an hour’s rain may last about 15 minutes longer. Humidity: The humidity level in the Peruvian Amazon stays constant throughout the year at around 80%.